"Prom Town House Motor Inn - Omaha, Nebraska - C. 1960's." (1849) POSTCARD: Prom Town House Motor Inn - Omaha, Nebraska - C. 1960's. -Condition: Very Good. - Has Not been Posted. 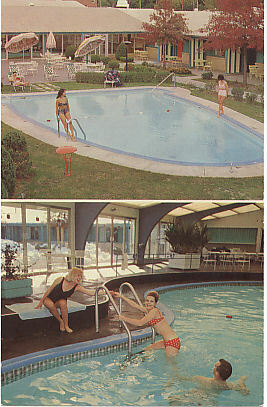 Photo of swimmers in an indoor and outdoor pool. Note written on back has date of stay. Price: $2.50 + shipping.